Money Mayhem - Polish Etc. Since today is the first day of the month I thought I would start something fun! February is the first month that I've kept track of my polish spending in an attempt to get it under control. Nail polish is an easy thing to get carried away with because you pick up a bottle, spend $3 and get a little more enjoyment out of your day. If you're a stress-shopper like I tend to be, you understand where I'm coming from. As your collection grows, you look at a $5 polish that used to be too expensive for you and pick it up one or two of them on a particularly bad day, (because well, it was just a terrible day and it's such a pretty color). Welcome to the world of retail therapy. After collecting polish for a few months or years everything suddenly looks different. Spending $8 on a polish is normal, and on a bad day buying a couple of $14 polishes doesn't seem so bad. Then a new limited edition indie collection comes out and you spend $10 each on 6 polishes, because you were fast enough during the restock to get them all (not everyone was fast enough you know, you're just so good at grabbing polishes on these re-stocks). One day when you're going to put a polish in your drawer/shelf/helmer you realize it's full, there's no more room for that OPI in the OPI drawer and you couldn't possibly put it with the China Glaze, so you clean out some polishes that you never wear, sell them for about 50% of what you paid for them, and use all of that money to buy new polishes. Then you have so much polish that you need to make a database just to be sure you don't buy duplicates of polishes you already own. My spreadsheet took me three days and I still haven't gotten to the last drawer of my Helmer. So this month, I decided to write down every polish I purchased and how much I paid for them. I feel successful in that I added less than 20 polishes to my collection. I'm hoping that by keeping track of this I will slow down my polish-purchases so I don't go broke! It's already prevented me from those random Walgreens trips where I pick up polishes that I will probably never wear just for the sake of shopping. I was going to announce my monthly budget on the blog but I thought of something even more fun. on nail polish this month wins the giveaway prize. Open to US/CAN residents only. (With all of the changes in shipping I can't offer an international prize at this time but hope to in the future. Must be 18 or older to enter or have parental approval. Limit one guess per person. You may not change this guess once you have made it. To enter, leave your guess in the form below. Be sure to use an email address that you check regularly. If no one correctly guesses the amount in 4 days (or 96 hours from the time of this posting) the winner will be the person who comes the closest to the actual number. Any guesses after 4 days will become invalid. The winner will be emailed and the results posted on this blog. That person then has 48 hours to respond to my email or the person with the next closest number will be chosen as the winner. 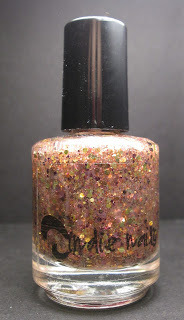 Pretty Penny is a new glitter packed full of glitters, shimmers and color shifting shimmer. It has light pink and light gold round glitters, wine metallic, bronze metallic, classic gold plus gold shimmer and color shifting shimmer that shifts from pink to gold! Absolutely beautiful! No fishing, applies easily! I've read that it can be layered over another polish or worn alone (3 coats to opaque). I have a bottle that I haven't tried yet (darn that restock addiction)! So what are your guesses? I sooo see myself in your description of how one progresses from buying 3$ polishes to spending dozens if not hundreds of dollars on entire collections. I'm still not in the stage of buying whole collections, no matter how limited or inexpensive they may be, but I fear that I might stop being this rational. It's been fun so far, I've gotten a huge range of guesses from $0 up to $700! I know what you mean about the $5 polishes not seeming pricey anymore! After very little shopping you start to realize that most of those $2-3 polishes are pretty crappy and $5 is the new norm. Currently I can fit all of my polishes in one Caboodle & am hoping to stick with that. I really try not to buy any polishes similar to something I already have (no matter how pretty they are!) & just keep a nice range of colors. I tried to keep control of my stash by saying "I can't fill up this last drawer" but I think I've failed with that. For me I think $7 is the new norm, but I've paid up to $26 for a polish (just one so far). It's all so crazy! Bec, I sooo needed this! I think we've talked about this in SMYTC before, but despite my attempt at a budget I spent just as much this past month as the one before. I took your idea of keeping a purchase list and put it in a Google Doc along with my stash list...I'm pretty confident I found all of my purchases for the past couple of months since I keep that list so organized. My year-to-date total? 118 bottles at just over $1,000. Holy cow. I've paid $123.55 in shipping alone! I think that this reality check and my "no buy until I lose the last 10 lbs" promise I made for "Less Eating, More Polishing" will help out tremendously. I know there are others who spend that much in a month, but I have to stop justifying my insanity by comparing it to theirs, haha! Hahaha, this is a fun contest. I just threw out a number guessing how much I spend on about 20 polishes. Actually, I made it a little less because I assumed I bought them on sale. Retail therapy meets sale = happy day. Lol so true. I'm glad you've enjoyed the post! I did get all of the 20 on sale so you're probably close, but some were on sale for <$2 and some for <$20 (higher end brands). I wonder how it all balances out. Good luck!